Reduce your carbon footprint and utility bills at the same time. WaterFurnace geo-thermal systems use the free, renewable energy found in your own back yard to save up to 70% on heating, cooling, and hot water costs. The ground is able to maintain a higher rate of temperature consistency because it absorbs 47% of the suns energy (heat) as it hits the Earth's surface. WaterFurnace geo-thermal systems are able to tap into this free energy with an earth loop. This technology is then used to provide your home or office with central heating and cooling. 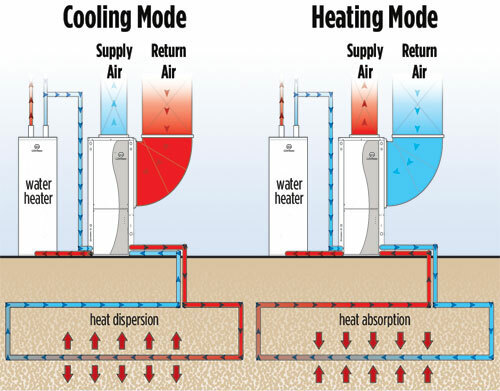 During the heating cycle, a WaterFurnace geo-thermal heat pump uses the earth loop to extract heat from the ground. As the system pulls heat from the loop it distributes it through a conventional duct system as warm air. The same heat energy can also be used for a radiant floor system or domestic hot water heating. Call City Suburban for more information about any product, and financing options are available with approved credit. City Suburban's most recent Geothermal projects.